Students of Center for Kuchipudi dance have the opportunity to perform at almost all the major events held in the Tri-state area as well as on its annual day. • Open to all ages (5 and above) and all levels of experience. 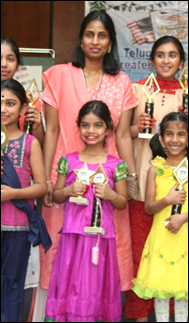 • CFKD also holds annual Kuchipudi summer dance camps. Kuchipudi classical and other folk dance dresses available for rentals. Please contact 732-940-7409 for further details.